The wing has four moving surfaces -a two piece elevon which forms the trailing edge and a two piece leading edge flap. The wing also features two airbrakes, one located on the upper surface and the other directly beneath it on the lower wing surface. The leading edge has an angle of 58° and the trailing edge an angle of 4°. The wing is constructed mostly of aluminium with carbon fibre/epoxy composites being used for the elevons and the airbrakes. Air Combat Manoeuvring(ACM) to enhance the lift generation. The inner leading edge flap deflects downward to a maximum of 15° while the outer flap deflects to a maximum of 20°. The flaps are controlled by computer. 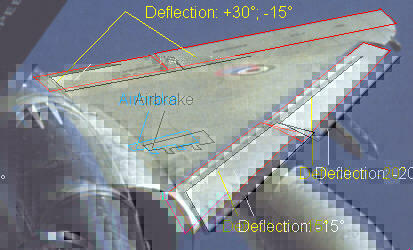 The elevons, forming the trailing edge of the wing, deflect upward to a maximum of 30° and 15° downwards.